Let's Explore the Ford Fusion Technology Features | Dean Arbour Ford of West Branch Inc.
Has the Ford Fusion caught your attention? At Dean Arbour Ford of West Branch Inc., our team is impressed with this popular midsize sedan because it offers a wide range of features, which include advanced technology features that enhance your driving experience. The Fusion is compatible with FordPass Connect. The allows you and your passengers to enjoy an in-vehicle Wi-Fi hotspot, which is powered by AT&T, and is accessible from up to 50 feet outside of the Fusion. The hotspot can power up to 10 devices. 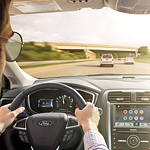 The Fusion also offers the available SYNC 3 infotainment system that comes with Apple CarPlay and Android Auto, which allows you to easily connect your smartphone to the infotainment's touchscreen. You can access Google Maps with Android Auto for voice-guided navigation, and Apple CarPlay allows you to connect to Siri, Apple Music, and Apple Maps. You can also enjoy a trial subscription to SiriusXM Radio that provides you with more than 150 music, entertainment, and news channels.